It’s winter! Which means cold weather and stuffy noses! Let’s uncover some holistic remedies that can help ease the symptoms and get you back on your feet in no time. Influenza can only be caused by three types of influenza viruses: types A, B, and C. The type A virus is most commonly associated with seasonal flu epidemics and is constantly mutating. Type A viruses can also infect animals, and wild birds are common hosts. The type B virus can only be found in humans and is not commonly associated with pandemics, though can still be the cause of seasonal epidemics. The type C virus can also only be found in humans and is characterized by much milder symptoms. Influenza viruses tend to mutate over time, which is why new flu shots emerge every year. While the influenza vaccine can protect against certain strains of type A and B viruses, there is currently no flu vaccine to protect against influenza caused by type C viruses. The flu is a highly contagious viral respiratory infection. The virus can enter the body through the mucous membranes of the nose, eyes, and mouth. Flu symptoms are marked by a dry cough, sore throat, chills, muscle or body aches, headaches, a stuffy nose, severe fatigue, and a moderate to high fever. In children, flu symptoms may also include nausea and vomiting. These symptoms often come on rapidly without warning. Whether you’re looking to sip a mug of herbal tea, diffuse a healing essential oil blend, or use a fragrant, decongestant salve, there are plenty of ways to naturally alleviate some of your cold and flu symptoms. REST! Take time off from work, the gym, and any travel. Prioritize sleep and vegging on the couch with a hot cup of tea. Consider skipping the antibiotics (under doctor supervision of course). The flu is viral and cannot be remedied with antibiotics. Plus antibiotics can put a damper on your gut health. Take it from MONQ, here are her herbs for fighting the flu this season! Please visit her original article for citations and references. While ginger may be well-known for its ability to calm an upset stomach, it also boasts anti-inflammatory properties that can help alleviate symptoms of both cold and flu. For a powerful anti-inflammatory hot tea, combine a fresh ginger root with turmeric, lemon, cayenne pepper, manuka honey, and a pinch of black pepper. Lemons have anti-inflammatory properties, help boost the immune system, and can promote the flushing of toxins from the body. They can also relieve respiratory symptoms and nausea. Cayenne pepper can help alleviate the symptoms of cold and flu by clearing mucus and reducing fevers. Manuka honey is known for its antiviral, antibacterial, and antifungal properties. Combined together in one hot drink, this is a powerhouse that can leave you feeling better in no time. Many studies have been conducted to test the efficacy of echinacea on the symptoms of cold and flu, with mixed results. Even so, echinacea is one of the most widely-known ways of naturally relieving symptoms of the common cold. Part of the reason why these studies are so contradictory is that there are many different species of echinacea, three of which are commonly used medicinally. The preparations of the medicinal species vary, with some using the root, and others using the flower, leaves, or even the whole plant. The plant can be made into a tincture or ground into tablets. Depending on the species of echinacea used, the part of the plant used, and the method of treatment, the results can vary widely. In one 2007 study conducted by the University of Connecticut, echinacea was found to reduce the chances of catching a common cold by 58 percent and was able to reduce the duration of the common cold by one and a half days. In another study published in 2009, the efficacy of an extract of echinacea was tested against five different type A influenza viruses. The results showed that echinacea effectively blocked the replication of all viruses tested. Even more notable is the fact that even after repeated treatment cycles, there seemed to be no resistance built up to the treatment. To use echinacea to prevent illness or shorten the duration of symptoms, you can drink echinacea in a tea, take a small amount of a tincture daily, or create a natural herbal throat spray to ease throat pain. It’s important to note that echinacea should not be taken in any form by individuals who have an autoimmune disease. Zinc is a trace element that is necessary for maintaining a healthy immune system. The body doesn’t make it naturally, so humans need to get it from in daily diet or through supplements. However, the supplementation of zinc to treat cold or flu symptoms has been widely-studied, and like echinacea, the results are mixed. A 2011 study published in The Open Respiratory Medicine Journal attempted to understand why the results of zinc studies were so widespread. The theory was that the daily total dose of zinc might explain the variation in results. As it turns out, studies that used daily total zinc doses of less than 75 mg often showed no positive results, while those that used a daily total dose of over 75 mg showed up to a 42 percent reduction in the duration of colds. The results of this study show that higher doses of zinc may, in fact, shorten the duration of colds, while lower doses do not provide significant benefits. In order for zinc to be most effective, doses should be taken within the first 24 hours of noticing cold or flu symptoms. Zinc can be taken as a pill, powder, liquid, gummy, capsule, or lozenge, though the lozenges seem to be the most effective way to shorten the duration of illness and minimize symptoms. However, it’s important to note that excessive zinc intake can be harmful to health. Excess zinc intake may cause nausea, vomiting, lack of appetite, headaches, or diarrhea and may also suppress the absorption of copper. Because of this, the maximum zinc intake recommended per day for adults over the age of 18 is 40mg. We love Pure Encapsulations. In a 2011 study, the efficacy of liquid elderberry extract was tested against type A and B influenza viruses. The results showed that the elderberry extract exhibited an inhibitory effect on the propagation of human influenza viruses and could be beneficial when used to combat infection. In another study published in 2016, the effect of elderberry supplements was tested on cold duration and symptoms in air travelers. In the study, 312 volunteers participated in a trial lasting 15 to 16 days depending on travel duration. Out of these volunteers, 158 individuals were given elderberry capsules and 152 were given a placebo. The results of the study showed that, on average, those who took the elderberry supplement experienced a cold that was two days shorter in duration than those who were taking the placebo and experienced less severe symptoms. If feeling a bit under the weather, take a tablespoon of elderberry syrup three times a day for three to five days until symptoms become less severe. It’s important to note that raw elderberries should not be eaten in place of a lozenge or syrup, as the uncooked berries can be mildly poisonous and cause nausea, vomiting, or diarrhea. Aside from using common herbs and spices to help ease your cough, clear your sinuses, and rid yourself of that pounding headache, there are plenty of essential oils that can help alleviate your symptoms when diffused throughout your home. You can also blend your favorite therapeutic oils to create soothing balms, decongesting salves, massage oils for sore muscles, and potent vapors that can clear both the sinuses and mind. Additionally, while many essential oils can help relieve respiratory symptoms, a handful can also help boost immune system function before a virus has even taken hold. Essential oil diffusers are one of the best ways to reap all of the therapeutic benefits of essential oils. You simply mix a few drops of essential oil with water in a room diffuser and then turn it on. The diffuser will disperse the oil throughout the air, and you can sit beside it to breathe in the vapors easily. When you’re on the go, a portable essential oil diffuser like Relieve is a quick and easy way to get the same benefits. Diffusing essential oils throughout a room can help rid the air of harmful pathogens and allow you to easily breathe in the therapeutic effects, but it is not as concentrated as when breathing the vapors of the oil directly from a bowl of steaming water. This method is especially helpful for clearing congestion. Just add a few drops of your essential oil of choice to a bowl of warm water, then cover your head with a towel and place your face over the bowl to trap the steam. You can then breathe the steam directly from the bowl for approximately five to 10 minutes to help relieve congestion. To reap benefits similar to those of steam inhalation, you can also add a few drops of your favorite essential oil to a warm bath and inhale from the comfort of the water. This On Guard blend from doTERRA can be used for literally any common cold or flu bug out there. This blend contains Wild Orange Peel, Clove, Cinnamon leaf, Rosemary, Tea Tree oil, and Eucalyptus leaf. I find it invigorating and soothing at the same time! Clove: Clove bud essential oil is known for having antiviral, antifungal, and antibacterial properties, which can help fight off infections in the body. It can also support the health of the respiratory system and help maintain a properly-functioning immune system. Tea Tree Oil: Tea tree essential oil has powerful antibacterial, antiviral, and antiseptic proprieties that make it a powerhouse for ridding your home of harmful pathogens. To prevent illnesses, you can use tea tree to make a natural disinfecting spray for the home. If you’re already suffering from cold or flu symptoms, add a few drops of tea tree essential oil to a warm bath or diffuse throughout the home. If you have a lot of congestion, warm up a bowl of water and add a few drops of this essential oil. Cover your head with a towel, and breathe in the healing vapors for five to 10 minutes. Breathing in the steam can help to clear the sinuses. Eucalyptus Leaf: If you’ve ever had a whiff of eucalyptus essential oil while congested, you know first-hand how wonderful this essential oil is to have on hand. Simply sniffing the oil directly from the bottle can clear sinuses and help you breathe easier. Eucalyptus essential oil has both antiviral and decongestant properties, which can help prevent illness before it sets in, as well as help ease symptoms if you’re already sick. To clear up congestion, add a few drops of eucalyptus essential oil to a carrier oil and gently massage onto the chest and neck. Alternatively, add a few drops to a bowl of warm water and breathe in the steam, or gargle a couple of drops of eucalyptus oil in warm water to ease the pain of a sore throat. Tea Tree Essential Oil:Tea tree essential oil has powerful antibacterial, antiviral, and antiseptic proprieties that make it a powerhouse for ridding your home of harmful pathogens. To prevent illnesses, you can use tea tree to make a natural disinfecting spray for the home. If you’re already suffering from cold or flu symptoms, add a few drops of tea tree essential oil to a warm bath or diffuse throughout the home. If you have a lot of congestion, warm up a bowl of water and add a few drops of this essential oil. Cover your head with a towel, and breathe in the healing vapors for five to 10 minutes. Breathing in the steam can help to clear the sinuses. Cinnamon Leaf Essential Oil: Cinnamon leaf essential oil can help boost the immune system and support respiratory function due to its antimicrobial and anti-inflammatory properties. By diffusing cinnamon leaf essential oil throughout the home, you can help relieve inflammation in the throat and lungs that lead to coughing. Additionally, cinnamon leaf oil is a great addition to a natural disinfecting spray. Clove Bud Essential Oil: Clove bud essential oil is known for having antiviral, antifungal, and antibacterial properties, which can help fight off infections in the body. It can also support the health of the respiratory system and help maintain a properly-functioning immune system. To benefit from clove bud essential oil, add a drop or two onto the soles of the feet, diffuse throughout the home, or add to a warm bath. Rosemary Essential Oil: Rosemary is a powerhouse of an essential oil, boasting pain-relieving, stress-reducing, immune system-boosting, and respiratory-healing properties. It can also be used to calm the mind, relieve pain from headaches and achy muscles, fight infection and relieve congestion. The healing benefits of rosemary are best when it is inhaled through steam inhalation. You can also add this oil to a relaxing massage blend, warm bath, or vapor rub. 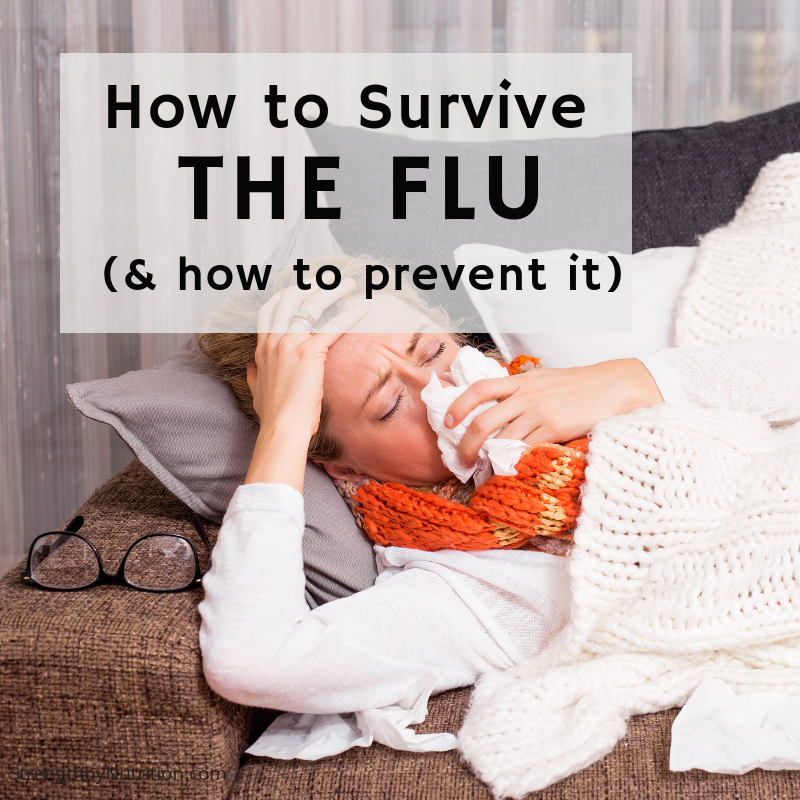 While there are no surefire ways to become immune from both cold and flu viruses, there are precautions to help boost your immune system and reduce your chances of contracting a virus. Wash Hands – keep hands clean with soap and water and make sure to keep them from touching your face often. Clean Surfaces (but don’t disinfect) – keep kitchen appliances, door knobs and common areas clean. However, don’t use antibacterial sprays, gels, and soaps. These contain triclosan which may be unsafe for human health. Eat a High Quality Diet: eating 3-4 cups of Organic fruits and vegetables per day will increase vitamins and minerals needed to keep the immune system humming along. Prioritize Gut Health: taking a probiotic along with Marshmallow root may increase mucous production and protection of the gut lining. We love Pro-15 and GI Revive by Designs for Health. Sleep: Used to getting 7-8 hrs of sleep each night? You may have to up the ante to 9-10 hrs. Going to bed earlier rather than sleeping in later has shown to improve energy and reduce illness faster. Supplements: consider zinc, magnesium, B complex, Vitamin C, and Vitamin D.